Yes it’s a golden truth that Multan is improving in real estate development, in coming year it’s expected that it will be in the list of most modern and busy cities. Multan is a swiftly emerging city of Pakistan that is growing with the rapid fire speed and thus hosts many high standard housing schemes in its vicinity. These housing projects are developed with remarkable features and facilities to give a comfortable life to the people. Royal Grace City is a new addition tin the city made by the Jinnah Builders and developers to provide a high-class living. Royal Grace Multan will be a kind of project that Multan city ever had as it boasts the best location and an international standard infrastructure with the affordable rates. You will be definitely amazed to see that there are international level school, colleges, universities and research centers located in the Multan. Many students from all over the world come here for distinct purposes, these all nation need residence that’s why real estate agents are very possessive in introducing royal life style. Royal Grace City Multan is super hit offer by ZAM ZAM estate developers. Royal Grace City Multan has all essentials which we need for lavish and extra comfort life. Let’s talk about Royal Grace City Multan location! The project is positioned on the Southern Bypass near Khera Chowk at Budhla Sant Road Multan. The location has a distance of merely 5 kilometers from Nayab Grace City Housing scheme and Multan Cricket Stadium. This dominant location is more than blessing because you mostly prefer these location for commercial business and now Royal Grace City Multan is offering you a chance for your residence on this perfect location. Are you ready to know about Royal Grace City Multan payment plan? 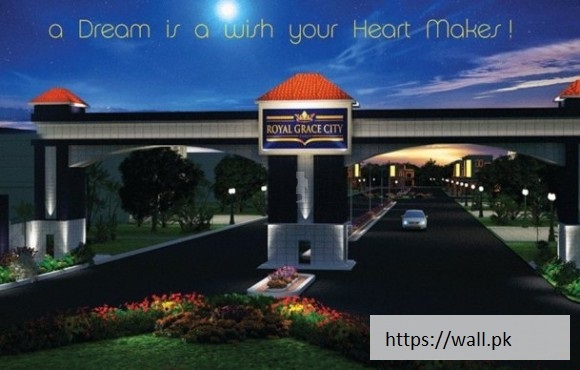 Royal Grace City is an ideal project that will provide you the residential plots of 5 Marla, 7 Marla, 10 Marla and 1 Kanal with well-developed infrastructure. The booking of any size of the plot can be made with 5% down Payment and then 5% as allocation amount after 30 days of booking, and the investor will have to pay 10% more amount after 60 days of booking; the Balance will be payable in monthly or quarterly installments. Royal Grace City Multan is a symbol of modern state of art which is mostly relate with western living. Multan is in the list of those cities which has wide area but it need proper development to look graceful, now real estate agents are looking forward for lavish development and the result comes out in the form of Royal Grace City Multan. The main plus point given by Royal Grace City Multan developer is payment plan, it’s completely considered economical by all clients. Royal Grace City Multan developers get highly positive feedback on payment plan from their clients. 10% Extra on Corner Plots. You can buy property on cash if you can effort complete payment at a time. Royal Grace City Multan is giving special discount to those clients who are giving complete payment at a time. Are you agreed to pay your property payment on monthly basis? Monthly installments will best way in payment paying for those clients who are doing job. Quarterly installments system is another super hit way in payment paying, it will be best strategy for farmers. If you are interested in Royal Grace City Multan property then you can use Quarterly installment process as well. Annual installment is last option in paying your payment. You can apply for any installment process according to your needs. Annual installment process is the best way for business man for paying property payment. Developers map Royal Grace City on the main location of Southern Bypass Multan. Royal Grace City not only connected with one main road but also has direct link with Budhla Road and Multan-Faisalabad Road. All commercial areas are located on the walking distance from Royal Orchard Multan. Royal Grace City is surrounded by schools, colleges, hospitals, offices, parks and top transportation links. If you are coming from Suzuki Showroom Southern By pass then you just need to travel for 5 Minutes to approach Grace City Multan. Vehari Chok is also directly connected with Grace City Multan within 7 Mins drive. New Katchery is located on 10 Minutes distance from Grace City Multan. DHA is a famous brand of residential housing scheme located on the 10 minutes distance from Grace City Multan. By knowing the actual image of Grace City Multan location, I am sure you would be more crazy to visit Grace City Multan at least once. Royal Grace City Multan has complete description by its name. Are you willing to adopt royal living style? If yes then read all details. First of all when we judge any residential and commercial area or society, we first observe its location, secondly we take depth study about what essentials are available in that area. But sometimes it’s difficult to judge that facilities provided by society are long term or short term. Royal Grace City Multan is really very cheap and affordable for almost every kind of people. What i loved in Royal Grace City Multan is, that it gives possession right when you pay for the Booking. The installments are cheap there.